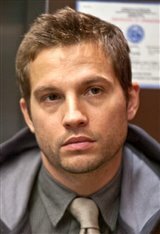 Logan Marshall-Green was born in Charleston, South Carolina and raised by his mother, Lowry Marshall, in Cranston, Rhode Island. He completed his undergraduate studies at the University of Tennessee, Knoxville. Logan then attended the National Theater Institute in Waterford, Connecticut and went on to earn his Masters in Fine Arts at New York University's Graduate Acting Program at the Tisch School of the Arts. Logan appeared as a guest star in both Law & Order: Special Victims Unit (2003) and Law & Order (2004), before landing recurring roles on the hit teen series The O.C. (2005) and the long-running series 24 (2005). His star was on the rise in 2005, with a starring role in the film Alchemy and another in The Great Raid . Following a starring role as Dean Bendis, an undercover police officer in a black ops group in the TNT series Dark Blue (2009), Logan made the transition onto the big screen with starring roles in Universal's Devil (2010), Prometheus (2012) with Charlize Theron and Guy Pearce, Black Dog, Red Dog (2012) opposite Olivia Wilde and James Franco and the starring role as Grey Trace in the sci-fi horror film Upgrade (2018). He was in a longtime relationship with actress Marisa Tomei, beginning in 2008, but in 2012 married actress Diane Gaeta.